This highly acclaimed book is an international award winner, and is written by an investigative journalist, Greg O’Brien, who is afflicted by early onset Alzheimer’s disease. O’Brien goes into his own mind to chronicle the progress of his own disease, and presents a moving, but practical account of what’s it like to lose your mind, to see slices of your own identity slowly drifting away like blow balls. He likens the journey to a flyby of the dwarf planet Pluto, as seen through the lens of NASA’s intrepid spacecraft New Horizons. 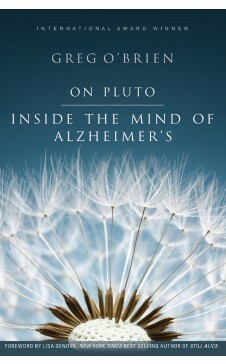 This is a book about living with Alzheimer’s, not dying with it. It is a book about hope, faith, and humour—a prescription far more powerful than the conventional medication available today to fight this disease. GREG O’BRIEN has more than 35 years of newspaper and magazine experience as a writer, editor, investigative reporter, and publisher. Over the years, he has contributed to the Huffington Post, Psychology Today, Washington Post, Chicago Tribune, Time, Associated Press, USA Today. The author/editor of several books, O’Brien has published 17 books by other writers, and was a founding managing director of Community Newspaper Company, initially headquartered in Boston.